EMF radiation is all around us. Often times, we are not even aware that our household products are putting us at risk. For instance, heating blankets sound like a nice, warm idea, right? Well, that is until you know they emit radiation and your body is getting all that exposure, right against your body, while you sleep. If you use a heating blanket or electric blanket at night, you should stop. This type of blanket literally blankets you in high powered low frequency EMF radiation, penetrating your body. Since your heating blanket stays on at night, this is considered chronic exposure. There have also been studies showing these types of heating blankets are linked to childhood diseases like leukemia and can lead to an increased risk of miscarriage in pregnant woman. EMF radiation causes a whole slew of problems. It has been linked with cancer and stress. It affects your autoimmune system, reproductive system, and even your melatonin production, among other health issues. So, just ditch the heating blanket. Use heavier comforter or a duvet with feather down. Turn up your heat at night. Wear socks or a night hat to bed. Utilize a hot water bottle under your blanket or sheets. 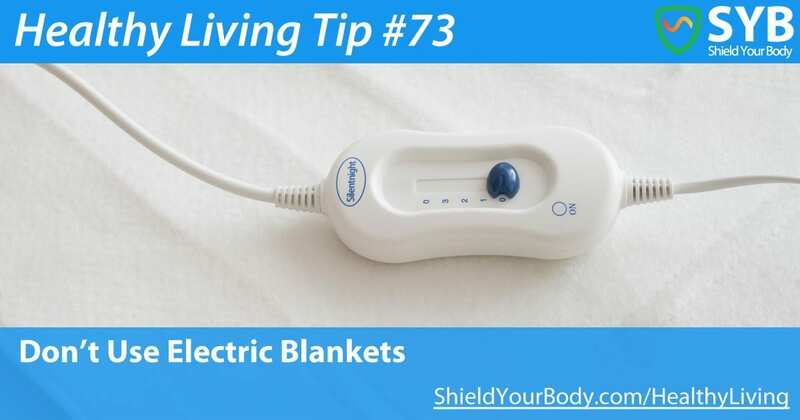 Keep your family and yourself safe by getting rid of electric blankets altogether. When it comes to your health, it’s always good to be informed and to learn which household products produce EMF radiation. If you would like to learn more about EMF radiation, how to product yourself and your family and what products can help reduce the risks of exposure visit www.shieldyourbody.com for more information. Be safe, not sorry.